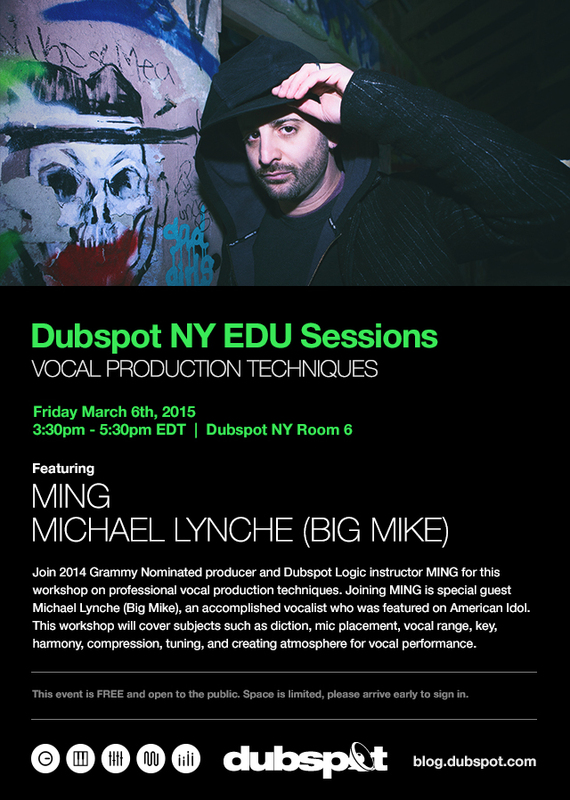 On Friday March 6th, our Dubspot NY EDU Sessions continue with a free workshop on vocal production techniques with 2014 Grammy Nominated producer and Dubspot Logic instructor MING and special guest Michael Lynche (Big Mike), an accomplished vocalist who was featured on American Idol. Join 2014 Grammy Nominated producer and Dubspot Logic instructor MING for this workshop on professional vocal production techniques. Joining Ming is special guest Michael Lynche (Big Mike), an accomplished vocalist who was featured on American Idol. This workshop will cover subjects such as diction, mic placement, vocal range, key, harmony, compression, tuning, and creating atmosphere for vocal performance. Grammy-nominated DJ and producer MING has spawned EDM trends for two decades. Just ask Steve Aoki, who publicly proclaimed MING “a legend.” To fans’ delight, that legend is still very much in the making. Most music makers would beam at such plaudits. But the New York native and adoptive Harlemite born Aaron Albano is matter-of-fact about his place in the game. MING is equal parts producer, songwriter, remixer, multi-instrumentalist, and studio savant. He’s again turning heads – consider his massive, genre-bending Blackout EP on Datsik’s Firepower Records– and topping charts—simultaneously notching four Top 40 trap remixes on Beatport. Michael Lynche’s life has been defined by two things: love and second chances. The Florida native and devoted family man’s rise from obscurity was well documented through his riveting appearance on American Idol. Known to America as “Big Mike,” he was famously “saved” by the judges, giving him a second chance to continue through the prized competition. After wowing millions of fans on American Idol with his comforting and powerful voice and performing throughout the United States as part of the American Idol LIVE! tour, Michael has created his sonically rich and lyrically inviting debut album. The first single, “Who’s Gonna Love You More” has been rising steadily on the Urban Adult Contemporary charts. The second single, “Today” has impacted Adult Contemporary and Smooth Jazz radio this summer.